Regardless what it looks like outside, the MN State Fair begins in 150 days. 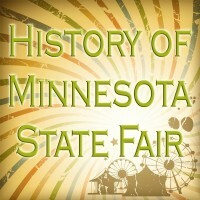 This Wednesday, March 26, is the official opening to State Fair season with a "History of MN State Fair" program at the St. Cloud Public Library. Hear all the juicy details of what goes on behind the scenes to make the State Fair truly the Great MN Get Together. Thursday, March 26 from 3:00 to 4:00 p.m. in the library's Mississippi Community Room.